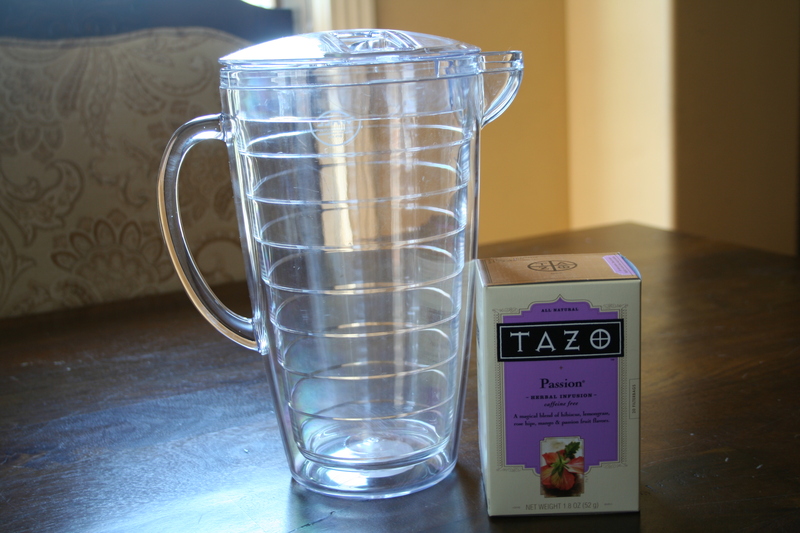 We’ve talked tea a bit in this giveaway, so what would this giveaway be without a pitcher to make your very own, OR perhaps you would like to try Denise’s favorite special ginger tea recipe. OR maybe you would like to try her white wine sangria? I’ve had both and they are so very yummy. 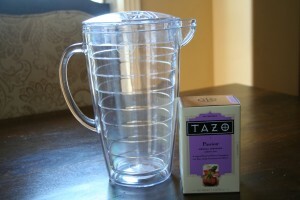 With the pitcher you will receive a handwritten(by Denise) copy of her recipes and a box of passion tea. Today I ask that you share with us a favorite summertime recipe for a drink. That way all of us win, because we get to try some new great drink recipes. If you don’t want to write it out and have a link to it that would be fine too. So today you need to share a summertime drink recipe. You will have until Friday the 29th at midnight to post your recipe. We use the random number generator on www.random.org to choose the winner each day. Paola Bell is the winner of our day fourteen giveaway. Congratulations. You will have to let us know how you like Denise’s drink recipes. We will be contacting you by email for your mailing address so we can get it shipped off to you. Boil 1 quart water and steep tea bags for about 10 minutes. Remove tea bags and toss away. In a tea pitcher mix sugar with hot tea and stir until the sugar is dissolved. Add 3 more quarts of water to make 1 gallon. Refrigerate until cold or serve over ice with some lemon wedges for taste. Mix together 1 can of frozen grape juice, 1 bottle lemon-lime soda, and cut up fruits like strawberries, peaches, blueberries, oranges, and apples. Serve cold. Boil 1 cup water and add sugar. Stir until sugar is dissolved and remove from heat. In pitcher, combine simple syrup with lime juice and add enough water to make 2 quarts (1/2 gal). Refrigerate until cold or serve over some ice.